ALMOST FORGOTTEN in the American scene are the decaying remains of the New England textile industry. But from the smallest villages to the largest of the cities, the landscape is dotted with old mills - a strikingly picturesque record of the early days of the Industrial Revolution. Manchester, N.H., was not the first of these mill towns, but it was, without question, the greatest. On a bank of the Merrimack River about thirty miles north of Lowell, Mass. (which had been founded as a utopian mill town), the Amoskeag Manufacturing Co. began building its plant in 1838. 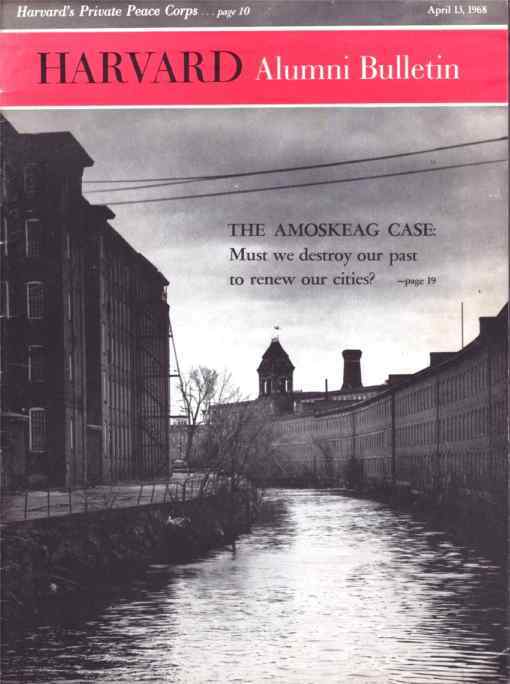 By the time of its collapse in 1936, Amoskeag was the largest textile manufacturer in the world. Through its century of life, its products ranged from fire engines and locomotives to Springfield rifles, in addition to an amazing volume of textile goods. A solid mile of mills stands today as the monument of this enterprise. These Manchester mills are much more than a record of the past. Unlike mills in other New England cities, they were laid out and designed by the engineering firm of one company. 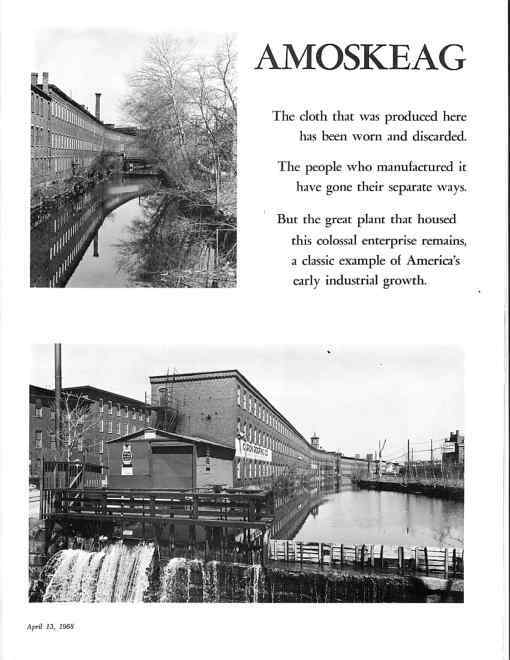 Although for most of its life the millyard was divided into separate sub-companies, it was Amoskeag Manufacturing that gave birth to the enterprise, determined its growth, and - in the final years - decided its fate. 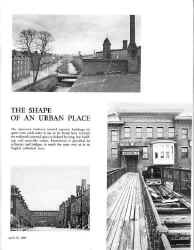 The company laid out the whole city from scratch, and made the millyard its heart; visually, the millyard is still the heart of Manchester today. The Amoskeag plant grew almost continuously for seventy-five years (the last building was constructed in 1915), so it provides an excellent reflection of changes in architectural style and taste. But the real value of the mill lies in its strikingly beautiful layout. Both the mills and the workers' housing are stylistically conservative for their times, and, except for a few examples of high Victorian fantasy in the towers and gateways, the buildings are remarkably plain. The reason for this restraint in the design of individual buildings becomes apparent when one enters this complex. No structure stands isolated or distinct. Instead the dense and continuous mass of red brick buildings flows together into a unified and organic whole. The millyard is open at each end, with canals and railroad tracks running through its entire length on two different levels above the river. However, instead of a long straight avenue, a gentle curve softens the rigor of the design, dividing the millyard into identifiable spaces. How much of this is a result of chance, and how much is a product of conscious design, is hard to say. But it is known that those who built the millyard had an uncommon sense of pride in the fabric of the plant, and a surprising respect for the value of what had come before their time. Progress for this industry was not marked by a repeated scrapping of the earlier buildings and a total remaking of the whole environment. Instead, it involved a continual adaptation of the earlier buildings to new needs, within an over-all design scheme that was just as valid at the end of the development as it was at the beginning a century before - and which, in terms of urban design, remains valid even today. 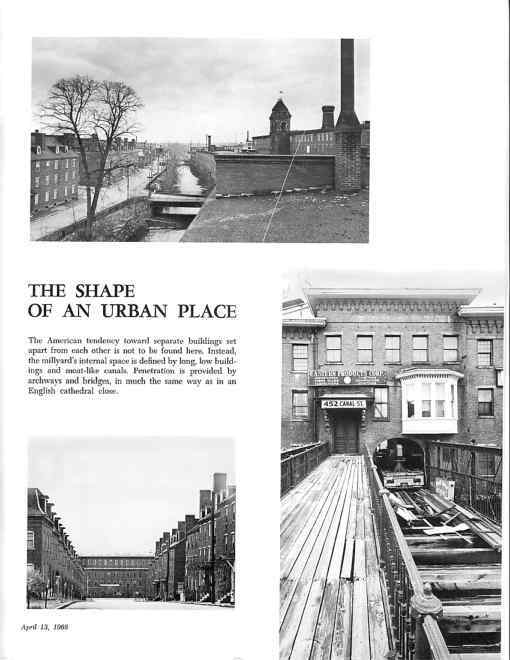 The Amoskeag design remained viable for such a period of time because it was based on an altogether human response to human needs, and was built to express that response as well as serve material demands. Today it has great value because it expresses the character of an age whose legacy is fast disappearing from the national scene. In terms of urban design, the millyard is unique. Nowhere else in this country, and in only a few places in the world, does such a unified and comprehensively designed area of this size exist. Indeed, in the face of the unprece­dented wave of destruction and redevelopment which is sweeping the country, it is surprising that Amoskeag is still intact. However, this only sharpens the tragedy that is about to occur there. In the name of economics, the millyard is about to lose those buildings which are most important in defining the urban space. 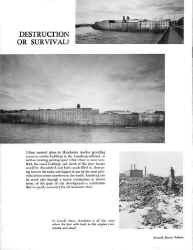 In 1936 the Amoskeag plant was purchased out of li­quidation by the local community, in a dramatic and imaginative effort to rescue the city from total unemploy­ment. Today approximately eighty different businesses occupy the space formerly held by one company. The problems caused by this diversity, the age and condition of the buildings, and the current use of trucks and auto­mobiles within the confines of the millyard are intense. 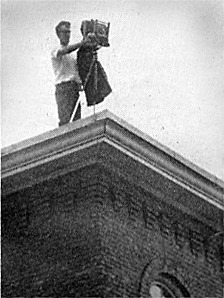 In 1961, Arthur D. Little Inc. issued a report to the Man­chester Housing Authority after a long and detailed study of the "economic problems and possibilities" in Man­chester. 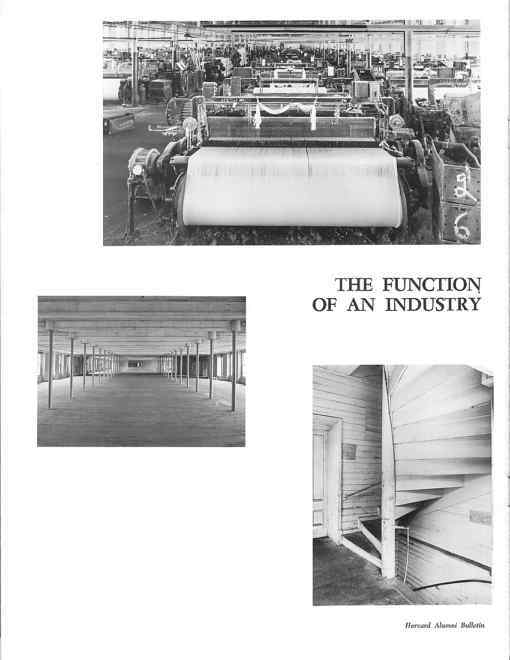 A major portion of this report was devoted to the millyard, because of its importance in the city's industrial base. Several basic alternatives were studied and dis­cussed, and general conclusions were reached. These con­clusions, which called for renovation of some buildings and removal of others, were based on much sound eco­nomic evidence. However, it was said that "even with ex­tensive improvements and upgrading, the millyard will never be an asset from an aesthetic point of view." With these words, judgment was passed on the quality of the millyard; after the proposed renewal, it would be the final judgment for all time. It would be unfair to say that the economic conclusions of the report are wrong or should not be considered. But it is impossible to do full justice to the area if it is to be flatly condemned visually, because it is out of style or lacks the flashy aluminum look that characterizes today's industrial parks. 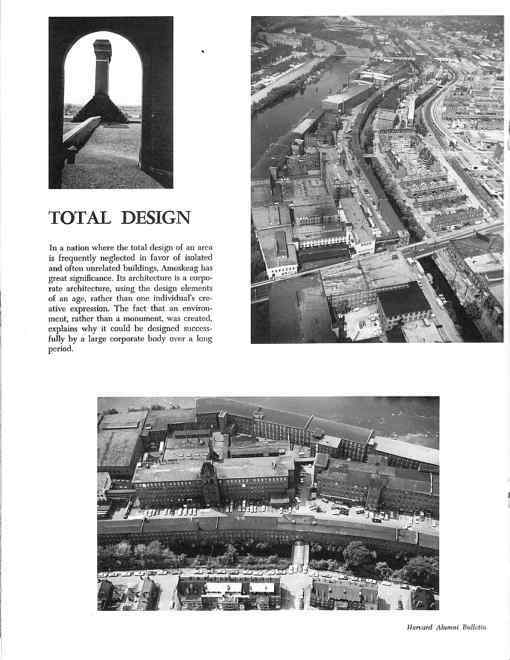 The current plan proposes that the long canal buildings and a major part of the river facade be destroyed, and the canals filled in. The large rectangular mills will stand iso­lated and characterless in a sea of trucks and automobiles. The dramatic continuous wall along the river bank will no longer face the highway on the other side, and the quiet spaces along the canals, divided from the bustle of the millyard by the long three-story canal building, will become a part of the bustle itself. The buildings that would be lost are not the largest buildings, but in terms of the environment in and around the millyard, they are the most important. In order to achieve the basic objec­tives of increased accessibility and more parking space, it is not necessary that all these buildings be destroyed. However, before they have a chance to survive, their value must be recognized. This means that along with the study of economic needs, a thorough examination of the visual environment should be made. WHAT IS IT that makes the millyard important to the city beyond, simply, its provision of space for business? Its qualities as an architectural monument do not alone make it important. The emphasis on its im­portance as an urban space comes a little closer, if one considers what, in fact, the value of an urban space is. Whereas a single great work of architecture may only be meaningful to those who have some academic knowl­edge as to what its merits are, a successful large-scale urban development is necessarily more intimately tied to the people of the city itself, because it encompasses more of their environment than any single building. It is hard to assess the value of Amoskeag in the terms of its sym­bolic impact on the lives of the Manchester people, be­cause, before people will realize its importance, it has to be removed or radically altered. What needs to be known about Amoskeag is its importance in American history, from its start as a primitive utopian community through its later transformation into an international melting-pot. Its role in the growth of American society is really more important and symbolic than the role of Williamsburg, which, although much venerated, was more English than American in style, and whose significance did not last through the greatest period of America's industrial and social growth, as did Manchester's. Manchester is today not simply a place where something important happened, but a city where inspiration from the past can be experi­enced from the fabric of the present - a living fabric, not an embalmed or reconstructed memorial. The visual im­age of the millyard sticks in people's minds, whether they live and work in the city or whether they drive by it on the turnpike. Reactions to it may be positive or negative, but what is important is that they occur. There is no one who, when passing through Manchester, does not notice the millyard, or who fails to react to it in some way. This is the real test of the value of a city. The response of the people involves something more intimately tied to their own lives than just notions of what is attractive or not. For the health of society, it is necessary that people have the opportunity to respond in this way to their environment. 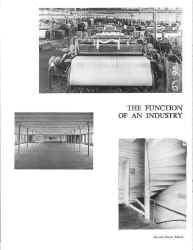 By limiting their analysis of the visual nature and im­portance of the millyard to a superficial value judgment, the economists and planners at Arthur D. Little seemed to overlook this. People tend to forget that economics is in fact a social science. In the face of the expansion of the non-city across the land, with its freeway-oriented sprawl, this nation needs to learn the importance of the readily identifiable place. In the effort to save our cities, too often we shear out their hearts, only to find that the computer program of an economic analysis is not sufficient to re­store them. Yet we are at a loss to know why. Perhaps by learning to look and see our environment, rather than by simply reading statistics, we can begin to find out. Amos­keag provides a lonely example of a powerful urban form with a scale appropriate to the cities of today. It is im­portant for Manchester and for the nation that it continue to exist, so that future generations may learn from it. UNDER an independent study in Architectural Sciences, Randolph Langenbach '68 is completing a thesis on the Amoskeag millyard and its significance in American urban design. 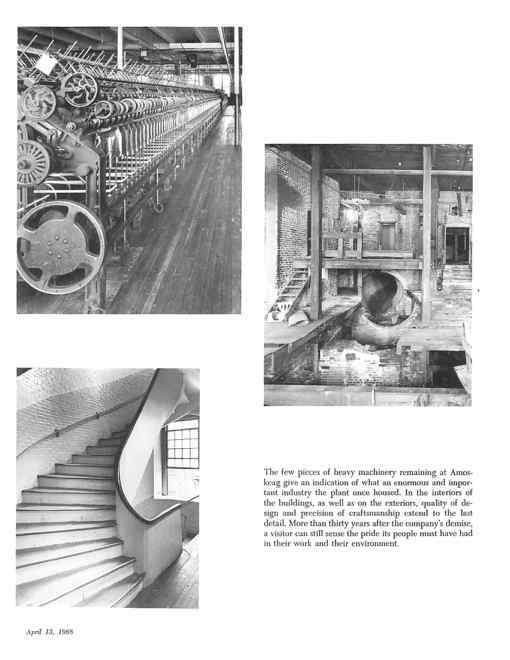 His photographs of the plant were made in connection with a project at the Carpenter Center for Visual Studies, and during a summer assignment under the direction of the Smithsonian Institution and the National Park Service Historic American Buildings Survey. *This article was written in 1968. Beginning that year and over the following decade, many of the most character-defining buildings were destroyed, and the canals were filled in, under urban renewal. Alas, there is now a University branch of UNH and a Museum in the Millyard, and the area has been finally recognized as an historic district, but it is now a mere shadow of its former state. The cloth that was produced here has been worn and discarded. The people who manufactured it have gone their separate ways. But the great plant that housed this colossal enterprise remains, a classic example of America's early industrial growth. In a nation where the total design of an area is frequently neglected in favor of isolated and often unrelated buildings, Amoskeag has great significance. Its architecture is a corporate architecture, using the design elements of an age, rather than one individual's creative expression. The fact that an environment, rather than a monument, was created, explains why it could be designed successfully by a large corporate body over a long period. The American tendency toward separate buildings set apart from each other is not to be found here. Instead, the millyard's internal space is defined by long, low build­ings and moat-like canals. 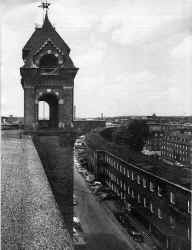 Penetration is provided by archways and bridges, in much the same way as in an English cathedral close. 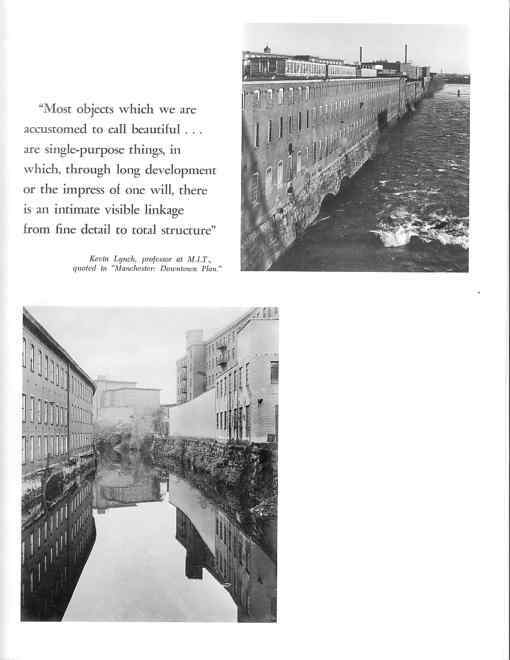 "Most objects which we are accustomed to call beautiful ... are single-purpose things, in which, through long development or the impress of one will, there is an intimate visible linkage from fine detail to total structure"
Kevin Lynch, professor at M.I.T., quoted in "Manchester: Downtown Plan." The few pieces of heavy machinery remaining at Amos­keag give an indication of what an enormous and impor­tant industry the plant once housed. In the interiors of the buildings, as well as on the exteriors, quality of de­sign and precision of craftsmanship extend to the last detail. More than thirty years after the company's demise, a visitor can still sense the pride its people must have had in their work and their environment. 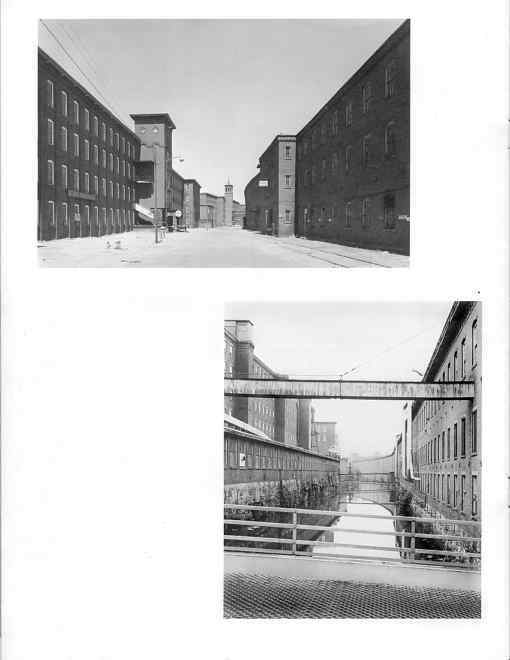 Urban renewal plans in Manchester involve providing access to certain buildings in the Amoskeag millyard, as well as creating parking space where there is none now. 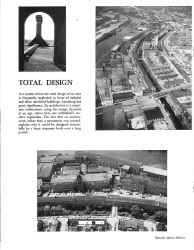 Both the canal buildings and much of the river facade would be demolished, and both canals filled in, destroying forever the unity and impact of one of the most powerful urban scenes anywhere in the world. Amoskeag can be saved only through a drastic redefinition, in human terms, of the goals of city development - a redefinition that is equally necessary for all American cities. 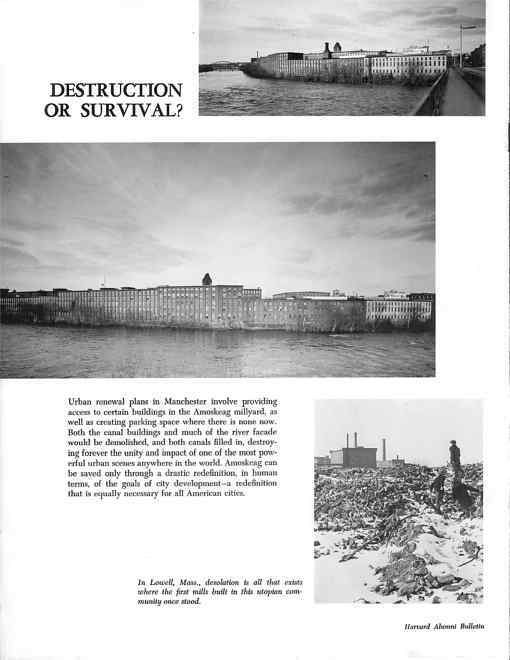 Bottom Right: In Lowell, Mass., desolation is all that exists where the first mills built in this utopian community once stood. From Table of Contents page: Driving up from Boston to the ski areas of New Hampshire, Randolph Langenbach '68 became curious about the great mill buildings across the Merrimack River from Route 93 in Manchester, N.H. Curiosity led to a visit, and the visit led to a documentary study, the basis of the article that begins on page 19 of this issue. Having photographed the mills from almost every conceivable location with his 4x5" view camera (picture), Langenbach has developed a consuming interest in saving them from destruction by urban renewal. The Amoskeag Case is unique in certain ways, but Langenbach's text and pictures in this issue make a statement that bears on the whole American heritage.